Where is my order or part of my order? If an item is missing from your order, it may be because it is being sent from a different warehouse or at a different time of year. For up to date product despatch information, please see the individual product pages. 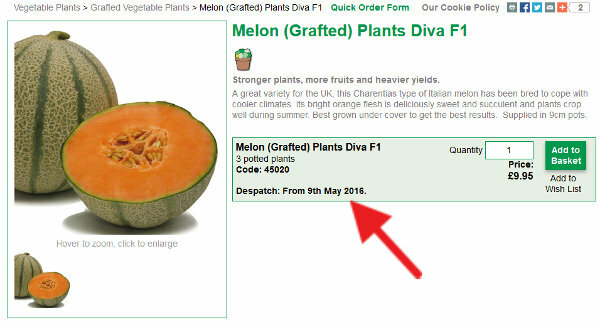 Despatch dates for live plants may vary, depending on growing conditions, so should be used as a guide only. If you’ve received a delivery, your order number can be found on the returns label at the bottom of the packing slip contained within your delivery. If you ordered online, your order number can be found on your order confirmation email, alternatively within your order history in the My Account Area. If you cannot find your order number please phone us to check your order status. Telephone: 0333 003 0869. Lines are open 8am to 8pm Monday to Friday and 9am to 5pm weekends..
Calls cost the same as calling 01 and 02 numbers and count towards inclusive allowances on landlines and on mobiles. You can track the status of your order here, even if you didn't place your order online or don't have an online account. Note: if you have a confirmation number containing a hyphen (such as 123-4444444) please use just the digits after the hyphen, ie. for 123-4444444, use 4444444.